Dr. Connie Nguyen came to the U.S. from Vietnam in 1975. She is certified in radiation oncology by the American Board of Radiology. She received her medical degree from the University of California in Los Angeles and served her internship at the UCLA School of Medicine. This was followed by a residency at the University of Stanford School of Medicine in Stanford, California. Dr. Nguyen specializes in brachytherapy, IMRT, and stereotactic radiation. She is a member of the American Society of Therapeutic Radiology and Oncology. 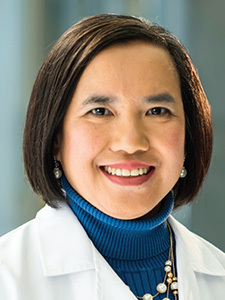 Dr. Nguyen is certified by MD Anderson Cancer Network®, a program of MD Anderson Cancer Center. University of California in Los Angeles School of Medicine, M.D.